Let me preface this that my family was not keen on the idea of eating green cookies. Apparently that’s taboo or something, kinda like how I feel about eating pork chops or salads. Very taboo indeed. Actually, eating red velvet is kind of taboo here. We just don’t do it. Confession time: uh, we don’t like red velvet anything. Zip. Zilch. Nada on the red velvet. It’s just… blah. Not my fave. When I worked at the cupcake factory, red velvet was the most popular flavor EVER. 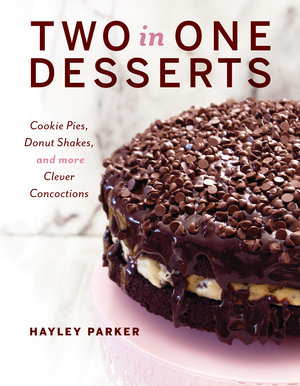 People would go positively bizerk for the damn cupcake. I mean, why? 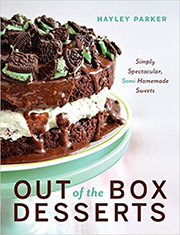 We had other flavors that were far superior to red velvet, yet people literally had temper tantrums like ill-behaved children when we sold out. What’s funny is, no one working there really liked the flavor, either. Therefore, I’m kind of convinced it’s a fad food. I mean, to make a cupcake factory, you kind of have to have some taste… I mean, you are selling cupcakes. And no one went apesh*t for red velvet. Just the plastic-surgerized moms and stuff. It’s like when I started eating sushi, it was becoming this big thing here in California. EVERYONE was talking about sushi and EVERYONE and their entire extended family went to this popular sushi restaurant and wouldn’t.stop.talking. about it. Ever. And then it kind of died down. People realized California rolls are boring and never tried anything worthwhile and stopped liking sushi. People will inevitably stop liking red velvet because it’s just… a fad. If y’all like red velvet, that’s cool. There are plenty of weird things I like, too. It’s just not my thing. Maybe because–gasp–chocolate ain’t my thing, either. Gah. I’m an awful food blogger. 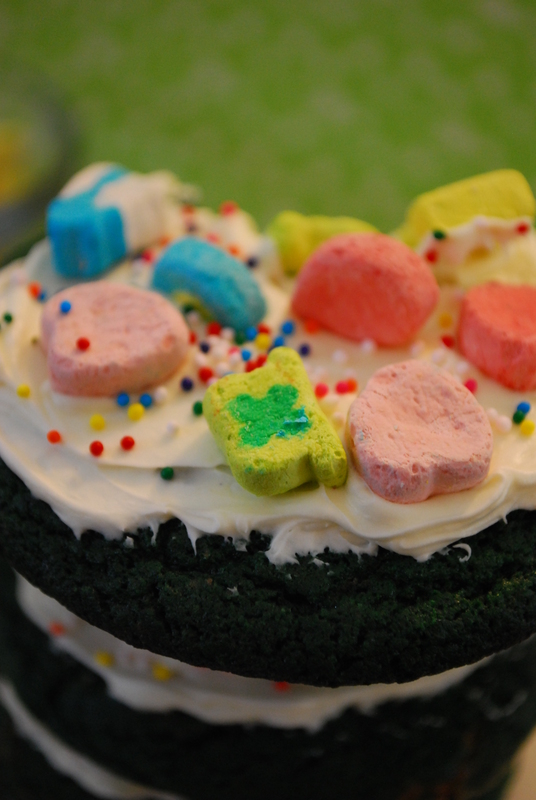 But because I love you and I think of my sweet, adorable readers who do love red velvet, I made you some festive St. Patty’s Day cookies that share my love for decorating cookies with your love for eating velvet-flavored and colored things. Ya dig? 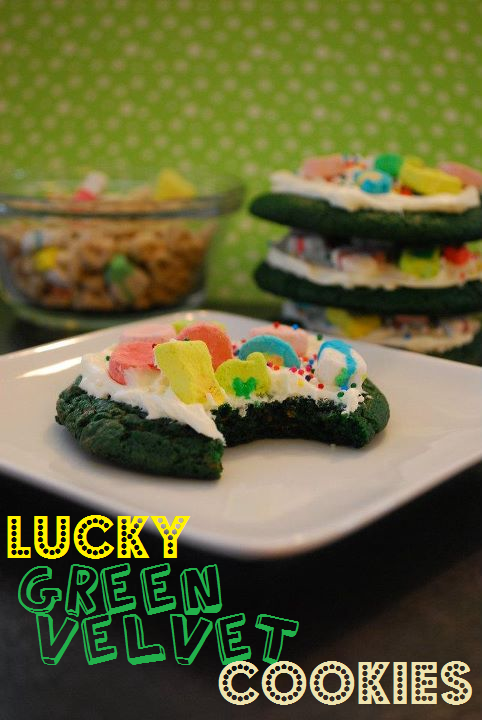 They’re Lucky Green Velvet Cookies, and hey, they’re actually kinda good. Rich and chocolatey, they have a good chew and a nice sweetness from the whipped cream cheese frosting. And don’t forget the crunch from the picked-from-the-box marshmallows of Lucky Charms. A festive cookie that’s far from fad, all 100% cute. And yes you can throw a tantrum that you don’t have some right now. I won’t blame you. 1. Preheat oven to 350 degrees F. Lightly grease two cookie sheets and blot excess spray with a paper towel. Set aside. 2. 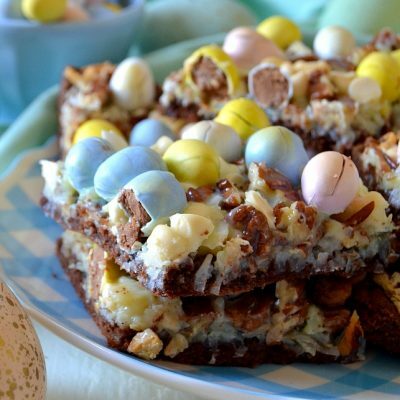 In a large bowl, mix the cake mix, eggs, oil and food coloring with a rubber spatula, stirring until everything is combined and a thick dough is achieved. 3. Portion batter by the heaping Tablespoonful onto greased cookie sheets, about an inch apart, and bake for approx. 10 minutes, rotating pans halfway through baking time, until set. Allow to cool on cookie sheets about 5 minutes before transferring to wire racks to cool completely. 4. Spread a heaping blob of frosting onto the tops of the cooled cookies. Sprinkle with the marshmallow charms and sprinkles, if desired. Store airtight for up to 2 days. Best eaten the day they’re made. Being sick hasn’t stopped me from eating a handful of cookies. I can’t get over how perfect and chewy cake mix cookies are, regardless of the flavor. 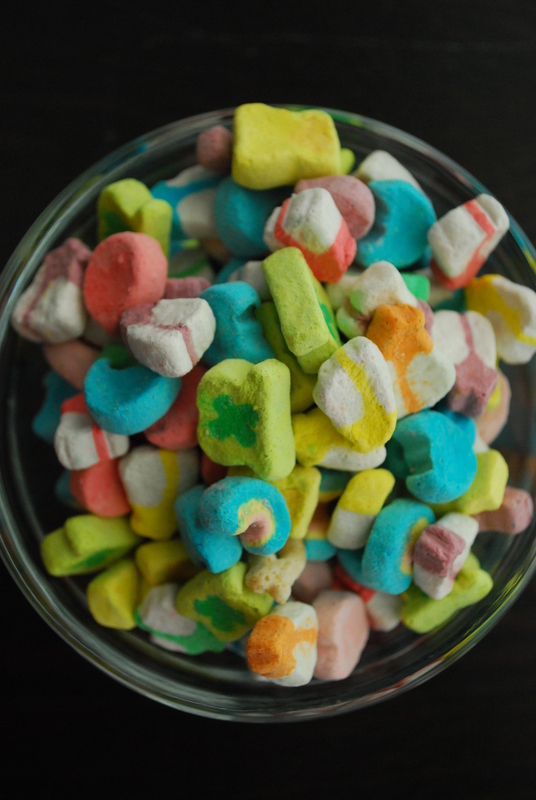 And I may or may not be guilty of always eating the charms out of Lucky Charms soooo the fact that they’re there, staring at me in their marshmallowy glory all pre-picked is pretty much perfect. I love the lucky charms on top! I think the reason I love red velvet stuff so much is because of the frosting. I mean, it’s all about the cream cheese frosting, right? Yeah, I’ve never been a big fan of red velvet. It’s pretty, but flavor-wise, there are like a billion other things I’d rather eat. 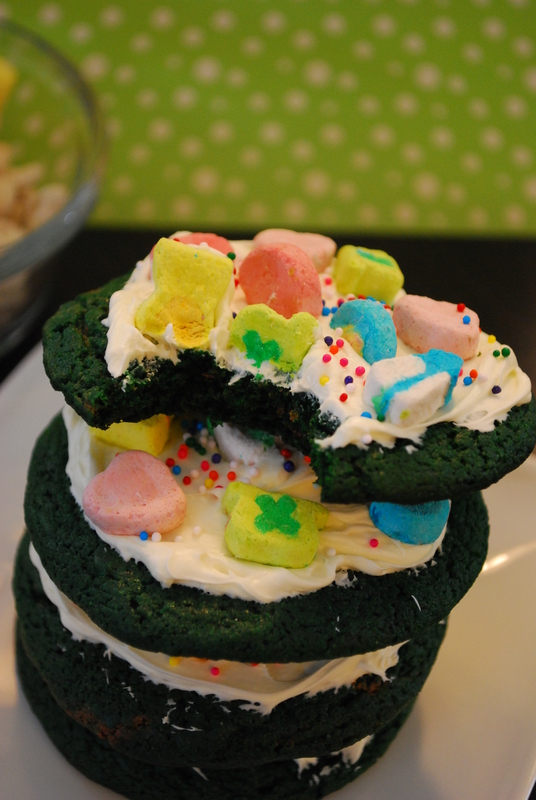 These green cookies–especially with the Lucky Charms–are super cute, and so festive. Love ’em! I couldn’t resist the charms 😉 thank you! okay they sounds great, but the green is totally throwing me off. I love red velvet but if it was not red I would still love the combination of cake and cream cheese icing. I have to say these were great! I totally tried making these and they disappeared within a few hours! Question though… How much food coloring did you use? My cookies did not come out as green as yours…any tips? Thanks! Hi Alyssa, thank you! I’ll definitely link these up! xo.